Distinct HIV-1 strains may differ in the nature of the CCR5 molecules to which they bind, affecting which cells they can infect and their ability to enter cells, according to a study published December 6 in the open-access journal PLOS Pathogens by Bernard Lagane of the Institut Pasteur and INSERM, and colleagues. As noted by the authors, the findings have implications for the development of HIV-1 entry inhibitors targeting CCR5. CCR5 is a protein on the surface of white blood cells involved in regulating host immune responses against pathogens. It also serves as an anchor for certain strains of HIV-1 to infect immune cells, thereby contributing to the development of AIDS. CCR5 exists in different forms, but the mechanisms that govern this diversity and its consequences on functions of the receptor remain unclear. Because genetically diverse viral strains populate HIV-1 infected individuals, Lagane and colleagues examined whether divergent viruses differ in the nature of the CCR5 molecules they use, and if so, whether this accounts for differences in their biological properties. The results provide positive answers to both of these questions. The researchers also identified CCR5 oligomerization—the formation of a molecular complex consisting of several CCR5 units—as a key process regulating the receptor conformational diversity, the extent to which HIV-1 can bind to target cells and the efficacy of viral entry. 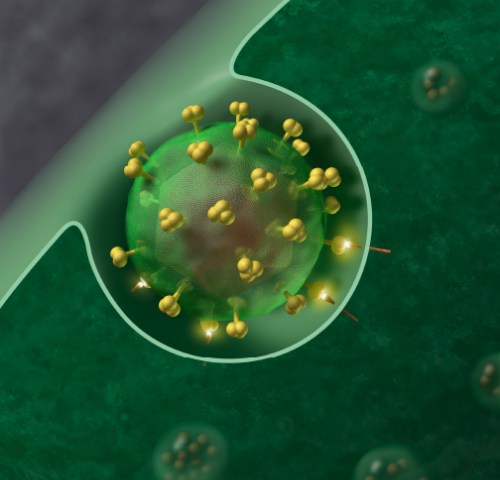 From a functional standpoint, the nature and quantity of the receptor populations used by HIV-1 strains regulate the type of cells they can infect and their ability to escape mechanisms that inhibit viral entry. According to the authors, this study represents a step toward understanding the mechanisms that regulate CCR5 diversity and its implications on viral biological properties, while opening new avenues for the development of drugs targeting CCR5. "Divergent HIV-1 strains may differ in the nature of the CCR5 forms they use for entry into host cells," concludes Lagane. "This is likely to control the type of cells they can infect and ability to resist inhibition by CCR5 targeting, anti-HIV compounds."